Sunny skies and crisp air, fall has arrived. It is time to head outdoors and enjoy fresh air. You can occupy your time with all sorts of outdoor fun; Las Vegas is home to a variety of recreational activities. When my husband and I have free-time you can usually find us hiking, off-roading or playing disc golf. Recently, my husband has gained an interest in golf. Each week he plays a new course to build his skills. Local specials, including casino employee discounts have made this an affordable hobby. 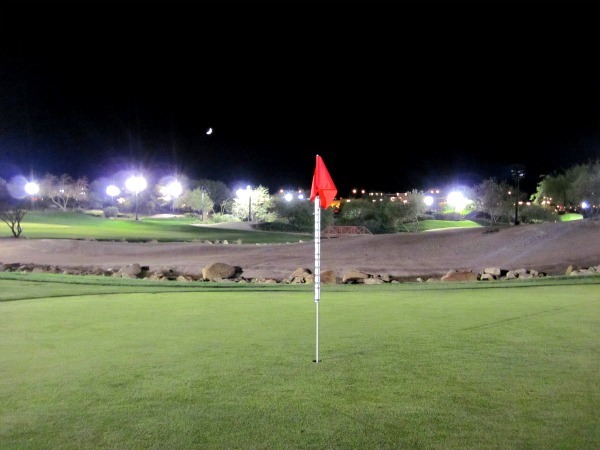 With more than a dozen public courses Las Vegas, why not take advantage? We live in golfer’s paradise, after all. Callaway Golf Center on Las Vegas Blvd. is well-known for its driving range. They also have a 9-hole three-par course called Devine Nine. It is lighted for evening play. Their business is mainly local residents, but they also see their share of tourists due to its proximity to the strip. Regular golf rates are very competitive, rounds start at $25 for adults and $19 for seniors. Their value play is a daily happy hour with tee times from 5-10pm; $25 covers a round of golf, use of the golf cart and two free drinks. This promotion is open to all; it is not limited to local residents. 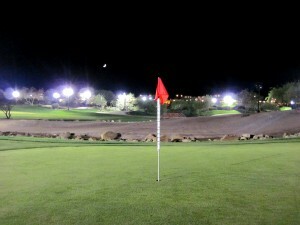 Rhodes Ranch Golf Club also offers twilight special after 4:30 for $25. This promotion is limited to locals; it also includes two beers and a bottle of water. The lush landscaping and 3,000 palm trees that line the fairways are what make this course special. Siena Golf Club and its sister course, Arroyo, offer deals for casino employees and/or local residents, too. At Siena, casino employees can book tee times up to two days in advance for $45. Here, the rolling rye grass fairways, contoured white sand bunkering and bentgrass greens are kept in superb condition year-round. Arroyo at the Red Rock County Club offers spectacular mountain and city views. It has $45 rates for casino employees every day. Additionally, Monday-Thursday, Clark County residents can play for $59; $69 on the weekends. 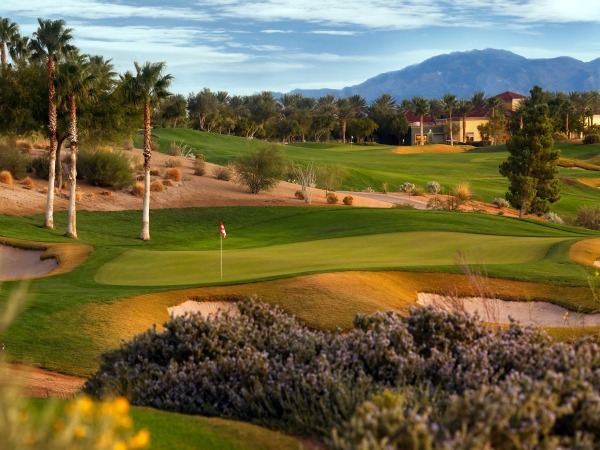 Discounts are even available at the nicest courses, such as Rio Secco and Bear’s Best. Bear’s Best was modeled on designer, Jack Nicklaus’ best work; it features impeccably manicured bentgrass greens, and every type of challenge. It has $50 rounds for casino employees and for local residents it is $89, every day. Rio Secco is set in the foothills of the Black Mountain Range. It has rounds from $60 for locals during off-peak times (8:30-1:00 is considered peak) Monday-Thursday, it’s $75 on the weekend. Casino employees can take an additional $10 off the local rates. 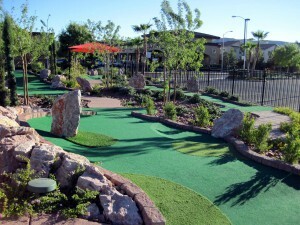 If you’re like me, and rather focus your skills on putting, The Putt Park is open daily, including evenings. The Putt Park is an 18-hole miniature golf course. It’s the only outdoor course in Las Vegas. General pricing is $8.50, children 6-12 years (5 and under are free) and seniors receive a dollar off. After sundown on Fridays and Saturdays Cosmic Golf is available. Glow in the dark balls create a new challenges, plus added fun. Discount coupons are often sent in mailers, also check out their twitter page for occasional promotions. Additionally, Las Vegas Half-off has $30 certificates for $15, which is a great option for families. Get out, enjoy the fresh air and have yourself a perfect par day. Kellee: We play at Callaway every week. As locals (and seniors) walking the course, it’s only $11, and if you fill up your little player’s card with 10 stamps, you get a free round. We played yesterday and the views of the Strip were lovely. That’s a great promotion to keep you coming back! I’ve only been at night, the strip lights glittering in the distance are very pretty. I’d also like to check it out during the day sometime.